Here is my fantasy: Vegetables will become medicine. Farmers will become as important and valued as doctors, and that's what I hold onto. 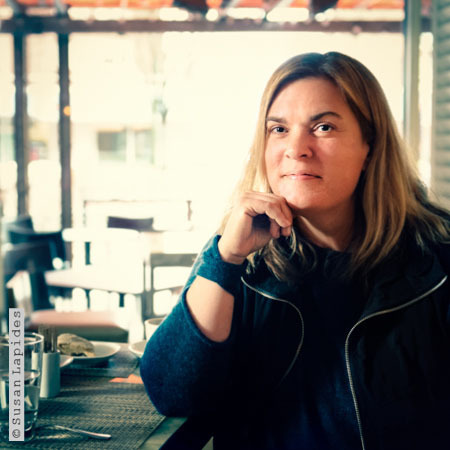 With a degree from La Varenne Ecole de Cuisine in Paris, the Seattle-born Ana Sortun opened Moncef Medeb’s Aigo Bistro in Concord, Massachusetts in the early 1990s. Today she owns Oleana and Sofra Bakery, and is soon to open Sarma in Somerville. Her Turkish-inspired foods have brought her a following across the globe. Today she is also advocating for vegetables to be prescribed as medicine. We think her fantasy will inspire. As a leading chef in America, what drew you to Cambridge? I think one of the things that occurred to me when I started cooking in Cambridge was its diversity. When I would walk into the dining room, which I hated doing because I have always been very shy especially when I initially started, I was able to meet so many different kinds of people. The diversity in Cambridge is huge for me. It was always a goal of mine to be able to cook for lots of different kinds of people, and not just people who had money or people who didn't have money, or people who were educated or people who weren't. There is just so much diversity here, both internationally and culturally. It's like a melting pot of a lot of different great things. What were you trying to change when you set out to open Oleana? A different style of Mediterranean food that was really interesting to me. I don't think I was necessarily trying to change anything, but rather to introduce. I wanted to represent something that was a study of mine – Mediterranean food with a different style of representation. What other goals were on your checklist? I wasn't thinking that way. My experience when I visited Turkey for the first time really inspired me. It inspired me to do something that just happened to be different than what was already happening here. It wasn't intentional. I didn't say, 'I'm going to open Oleana and change something.' It was more, 'I'm going to bring this inspiration that I just had and open a restaurant with it and see what happens,’ and it was kind of a risky thing to do because it was 2001. Lucky us. How has Cambridge changed? In the last year, there are more people coming to open restaurants and there's another generation of chefs coming in. Is there a foodie change going on as well? I don't think the people of Cambridge have changed. Rather, I think that people are opening up businesses over here more. It's saturated in certain areas in Boston, and Cambridge and Somerville are not. Maybe but I think it's changed as well. Maybe Cambridge will become an adjective too. In the 90s you opened Moncef Medeb’s Aigo Bistro in Concord, Mass after time at Casablanca, and in 2001, you opened Oleana, winning a James Beard award and an international reputation. Today you move towards a new destination in Somerville. How do you conjure up the courage to keep opening? For me, I have worked with two people for a long time. One is my business partner at Sofra and the other one is my business partner at the new place in Somerville, Sarma. These two women… well, I'm never going to work with people like this again. Maybe, but the chances are pretty slim. We've worked together for a long time and I've known them forever - from the beginning of their careers, and they're two really special people for me. I love the process ofopening something. It’s a really creative process. Again we are not necessarily trying to be different, but rather bring something that I think Boston could use. I love collaborating with these two women, and it's an opportunity for me to continue to work with them forever. They're the main source of inspiration, and traveling really inspires me whenever I go back to Turkey. The New York Times called your cooking at once rustic traditional, at best creative fusion, deeply inventive. Ana what is food to you? And why the Turkish influence from a girl from Seattle? This new place is very much inspired once again by Turkey, but mostly inspired by my business partners. It's a really collaborative project that a group of us have been working on it for a while. Who are these great inspirations? Two names: Moira Kilpatrick and then Cassie Piuma. What is the name of your new restaurant in Somerville and when will it open? Sarma. Opening in the late summer. You and Jody both support local farmers. Why are local farms important to you and what public attitude do you want to change? And what the hell was I thinking? (Laughter) Farming is work! Here is my fantasy. It's such a big topic for me. I didn't know much about farming, other than how hard it was physically, until I married my husband. Farming is perseverance like I've never seen. It's the only business where you have to start over every single year. Yet people are like, 'Wow, I can't believe how expensive your carrots are.' Well, you know what, it's not even about making money. It's about breaking even in the farming industry. It's a lifestyle choice, and thank God somebody wants to do it. Back to my fantasy… Vegetables will become medicine. Farmers will become as important and valued as doctors, and that's what I hold onto. That's my faith – that farms aren't going to disappear. I try not to say it to be pessimistic. I try really hard to be optimistic, but I see the struggle every year and I’m part of the struggle every year. This year, we had to cook for seventy people in the greenhouse just to keep us out of the red - just to keep us alive – to raise money to keep the farm existing. I think it's the CSA memberships that have really made the farm come back every year - only the CSA memberships. The farmer's markets, the wholesale restaurant accounts - none of those make a difference, but the CSA members make it work. At Oleana and Sofra, we do pay the farm that way. We act like a CSA and we pay a yearly average, so that we're writing a check to the farm twelve months a year and then we reconcile in September/October towards the end of the farming season. But it's not a simple answer, because I think the struggle for restaurants is figuring out how to be hard-core farm to table since, as Jody knows, it costs money. The cost of food is always an issue for restaurants, so how do you buy EVERYTHING from a farm versus being selective and only buying certain things from a farm? It's a model that's really difficult for restaurants, and I think they are trying and changing, but it's a big decision to make. Do you want to cut into your food costs or not? I would love the public to really see the reality of keeping farms alive without being pessimistic, but rather by being optimistic and value the importance of farms and spend a lot of money with them when they can - if the carrots cost a lot of money, there's a reason. It's a labor issue unless we want to pay somebody two bucks an hour, because that’s what it costs to grow that carrot organically here. Sorry, but that's the reality for real food. Farmers are not marking it up so that we can take an extra vacation. It doesn't even come down to that. It's just a matter of surviving and coming back the next year. Jody adds, “David Waters at Community Servings has written a white paper to request a bill that food be considered medicine so that a doctor can prescribe it. So that insurance would cover it. There's not a lot of money in vegetables like there is in pharmaceuticals. How do you balance your life with many restaurants and young children? You can’t have it all at once. For me, it's the people that are around me. It's my husband, my mother-in-law, and my staff that make it so that I can have a more flexible schedule, and it’s also timing. I think, as Jody said, that timing was pretty important. By the time we had kids, we had a much more flexible routine and honestly, it's like the last thing I think about. I don’t think about how I do it. I just do it and sometimes I'm torn. Where should I be? I do a lot of evaluating, like, 'how sick is she? Is it just a little sick where she could be with my mother-in-law? But I certainly feel like an outsider sometimes when I drive down the street at night. I'm the only mother in the neighborhood coming home at midnight. But I try to feel really lucky with what works. I see her first thing in the morning and that's pretty great, and I talk to her about what I'm doing at work and she thinks it's really cool. So it's really all she knows.Only a couple times have I ever heard her friends say, ‘Your parents both work a lot,’ but she doesn't seem to care. I don't necessarily stop and think about how hard it is because if I do, it may set me back. I just do it and it always seems to work out. Sometimes the decisions are hard, but I always feel really grateful when I can. Whether women want to be stay at home moms or they want to go to work, there are role models for everything. I think that instead of a working mom feeling bad about working, they should feel like they're setting an incredible example for their girls, and a great mother is an incredible example for young girls, too. But again, both are fine. Now, when kids see what we eat at our house or knowing what my daughter is eating, the food thing is a big one for me. Like Jody, I want to make sure she is eating good, real food. What do you dream of doing on summer vacation and where will you be? This summer is an exception for me, but the last three summers were pretty much the first time in my life where I've even taken a vacation, a traditional vacation, where you can relax and there's no agenda. I rented a house with another chef friend of mine (that would be the incredible Barbara Lynch) in Truro for a couple weeks, and she has a daughter that's almost same age as my daughter. They've known each other since they were born and while they are very different, they have a very special bond. Our husbands come as well, but not the entire time. The focus is around cooking and relaxing and not getting in the car too much. We have a yoga teacher come to the house and we cook for ourselves or for friends that are down there. We might only go out twice the whole two weeks we're there, and the rest of the time we're cooking. Barbara and I cook really well together. I think because we're so different too. (Editor’s note: Anyone else dreaming of being invited?) We’ve known each other for a long time and it's nice because she might start the morning off and say, 'How 'bout fish tonight?' or 'How 'bout just vegetables tonight?’ And then we'll go our separate ways during the day and then come back and I've got a pile that's different from her pile, and we just start cooking and pull it together. We know each other's styles so well that we can cook very nicely together - although - Barbara's very unpredictable which makes it interesting. It's such a relaxing, creative process to be in the kitchen when you don't have to race the clock, or you're cooking for pleasure not for work. It's the ultimate thing that makes us both happy. It’s similar to Jody, who said on vacation she starts her morning checking the fish market out and then does a lot of simple cooking. Our girls get to play and they love the whole two weeks. It is incredibly memorable for them too. That’s been a dream vacation the last three years, and I think I speak for Barbara, too. This concept of 'vacation' is a new thing for both of us the past few years after many years of hard work where usually there's a lot of traveling involved in our work and there's always an agenda. This is just very spontaneous and very relaxing. Do the little girls model you in the kitchen? They are getting to the age where they will make pasta, make pizza. Markesa, especially, she's a year older than Siena, and she does a lot of the pasta and pizza because she knows a lot of the pasta and pizza, and Siena does help me but she’s not quite able to chop and stuff yet. How do you inspire each other when you are cooking with other chefs? With Barbara we’ve known each other for so long, we don’t compete and we have a nice camaraderie. Jodi and Barbara have both been really big role models for me, especially in the importance of how they represent themselves and the sense of style that represents who they are. I love how these two have remained true to what they do. Barbara and I joke because I can’t make pasta and I call her and say what am I doing wrong. And I will joke around with Barbara about spices. We will egg each other, but really learn from each other. I was able to get over my pasta fear because of Barbara, and I have taught her the whole spice thing. What’s your favorite dish you make for yourself? I go back and forth. I mean, I actually really enjoy vegetables and not because I'm supposed to, being married to a farmer, but because I really, truly in my heart love vegetables. So most of my favorite dishes are vegetable-based. Those are the meals I actually enjoy the most. But cook for myself? It's never that special. When I'm cooking for someone or with someone, it's much different. If I'm cooking for myself, I'm usually trying consciously to eat something that's going to give me energy and sustain me. It's not necessarily for creative pleasure. So it's a different style of cooking, but I think one of my favorite things is soup. I notice you always have a unique soup at Sofra each day. I love your coddled egg soup there in the winter. It’s so rich and healthy. I'll have to tell them to do that a little more often. He probably put some barley in the bottom. Nice. Soups are really special. Once a week, on Sundays, I do a lot of preparation – at least two or three hours in the kitchen – where I'm just preparing so that there's stuff around the house. Do you cook in the morning? It depends. I'll start the morning and just get a few things on the stove and finish them in the afternoon but I always try to have dishes prepared. It helps my family and myself through the week to eat better, healthier options. Do you have any Sunday recipes for us? Well, you know what, I do! In the last year, once a week, we started a newsletter for our CSA members where I talk about what I do on Sundays, and it's become a ritual now for me because it's such a valuable thing to have during the week. I think when people get in trouble or they're feeling very uninspired, they reach for something that's store-bought, processed. It's all about the buildings blocks. Jodi talked about leftovers in her fridge as well and those leftovers…they're like gold. It's a starting block for something else that could become very simple, and they're like little handfuls of flavor that can start a meal. I purposefully fill the refrigerator with some little gold dishes: I usually cook a bean and I usually cook a grain so that they're around to add to salads or to make a soup. My daughter loves bean burritos and she loves beans. So, instead of getting refried beans from the can, I usually make a batch so that it's around to have for breakfast or in her lunch. I usually do something that both of them can eat during the week so that they don’t eat pizza every night. Not Dominos - they eat good pizza, but it's still pizza. It also makes me feel really good about not necessarily being there every night for dinner when I know there's some nutrition involved for both of them, and it's always fun. Sometimes I'll even just bake off potatoes or leave them something to do in a big mortar stone pestle - salsa or guacamole, so I'm always trying to think of what they can do that is fun. Would you give us a bit of sneak peek into Sarma, your new Somerville restaurant? It’s a mese restaurant. It's modeled after meyhane (pronounced may-ha-neh), which is a very traditional style of restaurant and bar in Turkey. It's a very traditional style of restaurant in Turkey as a brasserie would be to France. Since it's a mese restaurant, you drink and eat from small plates and drinking is part of meyhane. We have a big bar and it’s all small plates. It's not tapas, but it's the same idea. They're called mese in the Middle East and a lot of our cocktails will have spices. It's a very similar modern interpretation of the Middle Eastern or Eastern Mediterranean style that we do at Sofra and Oleana. It will feel like the same family. It's going to feel familiar, in other words, but it'll be a little - I keep wanting to say 'edgy' but edgy's not the right word - it's going to be very ‘Brooklyn.’ That's my new adjective I've been using lately. It's going to be so Somerville. So Somerville. Bottom of Winter Hill. And can you please keep the shakshuka on the menu at Sofra? I know. There are a couple things we can't take off. The whipped feta is another one. Oh, my God, I can't even believe how much we make. It just blows my mind sometimes.